The signature drink of the Kentucky Derby is the mint julep. It's a fantastic cocktail that's relatively simple to mix up and has influenced many other recipes. Today's mint julep is a simple mix of bourbon whiskey, sugar, and fresh mint. According to David Wondrich's book, "Imbibe!," it has been around since the Revolutionary War, though it wasn't always made with bourbon; brandy and gin were also popular spirits for the drink. That same customization has continued over the years. From comparable classics to modern interpretations, drinks inspired by the julep are filled with a diverse mix of flavors. The one thing you will need to create any of these cocktails is a good muddler. This is an essential tool that should be in every bar and is vital for releasing the aromatics from your mint and other ingredients in the initial smash. It can also be used to create crushed ice, which is essential to many juleps. 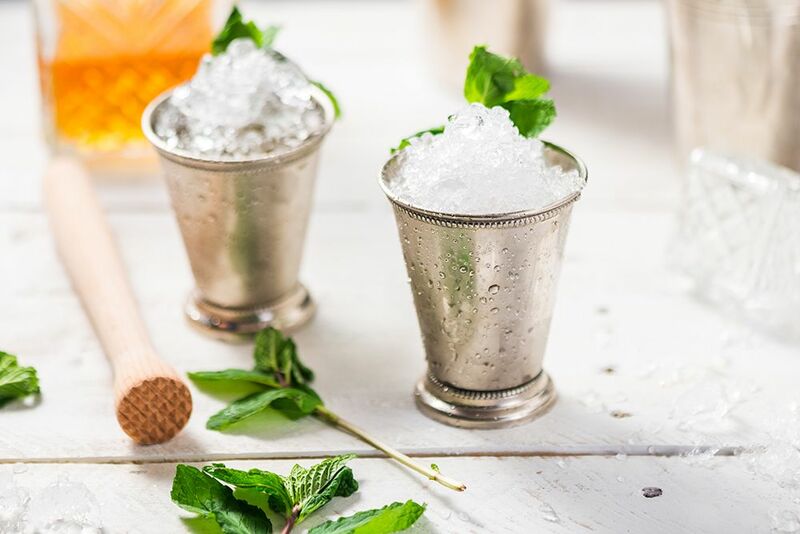 The classic recipe for a mint julep is very easy to create and you will enjoy its refreshing taste. It is, quite simply, a shot of your favorite bourbon poured over muddled mint and sugar. Don't forget the crushed ice. For an authentic Kentucky Derby experience, pick up a silver julep cup. It's a small touch that adds elegance to the occasion and ensures your julep stays frosty cold. As classic as the mint julep, the whiskey smash is nearly the same drink. It dates back to at least the 1880s and is one of the most refreshing smash drinks you can mix up. This classic whiskey recipe brings lemon into the mix, giving the drink a semi-tart background that is fascinating against the cool taste of fresh spearmint. It typically skips the crushed ice and makes a great option for race day. Though whiskey is essential to a mint julep, it's not the spirit of choice for everyone. If brandy is more your style, break with Derby Day tradition and mix up this classic drink. The brandy smash is very much like a julep. It begins with a muddle of mint, sugar, and a splash of club soda. Add a shot of your favorite brandy, fill the glass with ice, and enjoy. If you prefer a good gin, pour genever and enjoy it as a gin smash. It's time to get peachy! The white peach julep recipe is quite fun and a simple twist on the original. Though white peaches are not always available, any peach will do for this drink. The bourbon of choice here is the ultra smooth Maker's Mark, which has just enough sweetness to complement the fruit. The julep's sugar is replaced with a peach liqueur and the peach bitters are the perfect finishing touch. Bulleit Bourbon is rather bold and will definitely not get lost in any julep. It gets even more daring when you infuse the snappy spice of fresh ginger into the whiskey. For the ginger julep '68 fastback recipe, the mint is left out entirely. Instead, ginger is muddled to ramp up that flavor and it pairs perfectly with brown sugar. It's a unique spin but you do need to give yourself about two days for the infusion. The mint julep should not be reserved for that one Saturday in May when the horses run at Churchill Downs. It's fantastic any time of year. And yet, if you're in the mood for one in autumn, a recipe like the Tully 10 cider is just a little more appropriate for the season. This fascinating cocktail opts for a nice Irish whiskey and retains the mint and syrup. The seasonal ingredient is apple cider—either hard or nonalcoholic—which does surprisingly well against a couple of mint leaves. It's an adventure for the flavor curious. Using the gin smash as inspiration, the eye candy will surely tantalize your taste buds. This modern drink will create quite the buzz at your Derby watching party and it's a lot of fun to mix up. The recipe is filled with fresh flavors and is perfect for the spring season. It combines the popular Bombay Sapphire Gin with St. Germain Elderflower Liqueur and brings fresh ginger root into the minty muddle. Along similar lines, there's also a muddled mint cocktail for vodka lovers. The pot of gold is served in the style of a martini, though it can do just as well on the rocks. This recipe also pairs the floral taste of elderflower with fresh mint, but it adds fresh cucumber to the muddle. It's topped off with a splash of ginger beer, which gives a nice kick to the drink, leaving you with a cocktail you will not forget anytime soon. There's one more non-whiskey drink that's an excellent alternative and it's probably the easiest of the lot. The Combier royal smash features the delightfully sweet flavor of Royal Combier, an orange liqueur that can easily become a new staple in your bar. The lemon in this recipe makes it more of a whiskey smash. Yet, you will find that the citrus and mint are the perfect complements to the liqueur. A fun treat that every adult at your Derby party will enjoy, these peach julep ice pops are just as fun to make. The recipe combines fresh mint with peach juice and the bourbon of your choice. To give them an even mintier flavor, you can sprinkle fresh mint on the boozy treats before they freeze.